The Edmonton Oilers probably won’t make the playoffs in the 2010-11 season. Many prognosticators are already predicting that the Oil will finish dead last in the Western Conference, and it’s only August. Obviously over the course of a long hockey season, anything can happen, but the Oilers are in a re-build mode, and the most important thing for the team is start developing the promising talent they have in the system, starting with last year’s first overall pick Taylor Hall. The Oilers have made a few minor moves in the offseason, but all signs point to another losing season in Edmonton. Last week, the Oilers signed veteran netminder Martin Gerber to a two-way contract, and he will likely battle for a starting job on the Oilers farm team. With Gerber now in the system, the Oilers have four NHL level goalies, and it’s anyone’s guess who will be on the bench come the start of the season. The 37 year old Russian hasn’t exactly had a great career in Edmonton thus far. 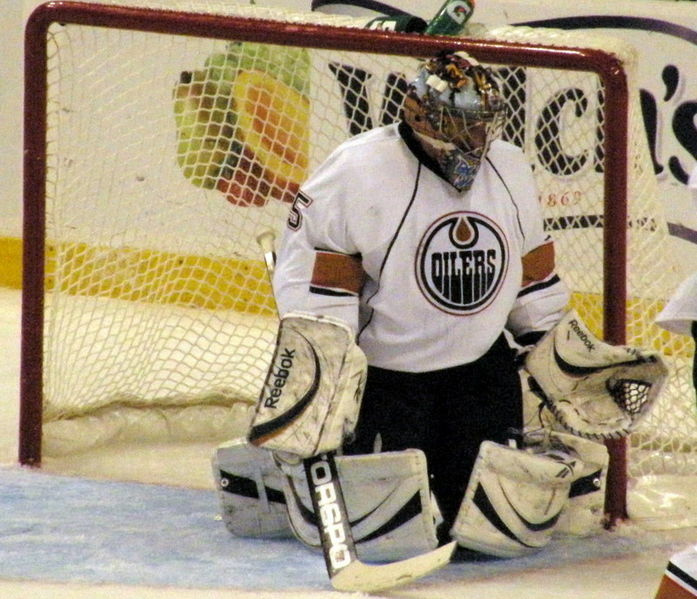 The former Stanley Cup champion signed a four year deal worth $15 million dollars with the Oilers on July 1st, 2009, but played only 18 games before undergoing surgery for a herniated disk in his back and sat out the remainder of the season. His record wasn’t stellar, going 7-9-2 with 3.03 goals against average. In February, he was arrested for speeding and impaired driving and was forced to appear in court. If he is convicted, the Oilers could void his contract, but there’s no indication that will happen. Assuming his legal issues and back problems are resolved by training camp, he will be the Oilers number one goalie. 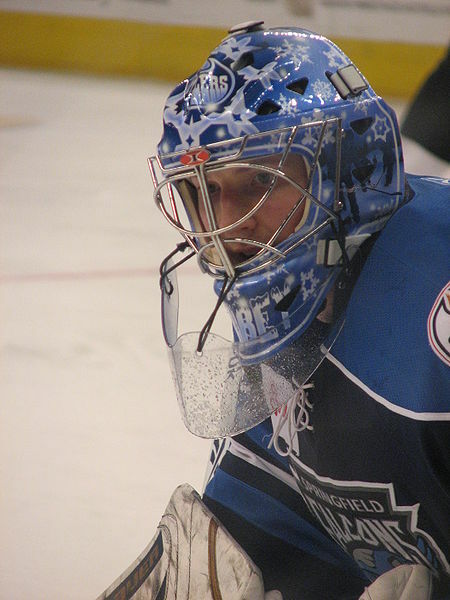 Signed as an insurance policy for the Oilers AHL affiliate the Springfield Falcons, the 35 year Swiss born goaltender will likely not see NHL action unless there are injuries to the other three Oiler goalies. Since his playoff run with Carolina in 2006, Gerber’s career has been less than notable. He went through stints with the Ottawa Senators and Toronto Maple Leafs, but found little success. 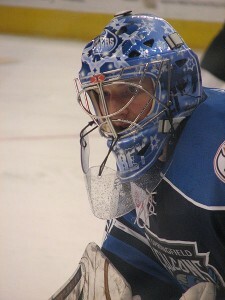 Last season he played in the KHL, but suffered a serious neck injury and was hospitalized. He is fully recovered now, and is hoping for another fresh start in the Oilers organization. The rookie started 19 games for the Oilers last year, and while his numbers weren’t great, he managed to show some potential playing for such a terrible team. Dubnyk recently re-signed with the Oilers for two years on a way one contract, signaling that he could be the back-up to Khabibulin in the upcoming season. Long pegged as the goalie of the future in Edmonton, Deslauriers was thrust into a starting role last year when Khabibulin was injured, but didn’t fare exceptionally well. Many thought the Oilers had given him enough chance to develop and would let him go, but Edmonton puzzled many by signing him to a one year contract extension. The contract extension indicates that there’s probably uncertainly surrounding Khabibulin’s status, and Deslauriers is another body to have in case of injury, and despite poor numbers he has proven that he is capable of playing at the NHL level. Needless to say, however, goaltending may not be the shinning point of the Edmonton Oilers season.